Written by Michael I. Magcamit and Aries A. Arugay. Politics is performance. Performance is politics. And if there is an acting award for ‘Best Performance in a Populist Role’, President Rodrigo Duterte of the Philippines would have easily clinched the title. The native of Mindanao delivers solid performances in all the three criteria for ‘outstanding’ populist acting category: a hypnotizing appeal to ‘the people’; a compelling branding of crisis, breakdown and threat; and a captivating personification of ‘bad manners’. In this two-part series, Duterte’s performance of political populism is critically assessed using Benjamin Moffitt and Simon Tormey’s (2014) model of populism as a political style. It should be made clear at the onset that the term ‘performance’ does not connote a fake form of acting on the part of Duterte. On the contrary, his moving performance as a lead actor in populist politics has made him an instant celebrity among his supporters and admirers, both locally and abroad. The growing mediatization of the present political landscape in the Philippines has created a scenario in which politicians like Duterte are scrutinized for the image and style that they project, rather than the content and substance of their proposed platforms and policies (see, Moffitt and Tormey 2014). Accordingly, performance has inevitably become a required skill that can either make or break a politician’s career. But as far as Duterte’s interpretation of the role of a populist leader is concerned, it made him an invincible and an infallible demigod in the eyes of ‘the people’. Moffit and Tormey define political style as a ‘repertoire of performative features which cuts across different political situations that are used to create political relations’. Based on this definition, greater emphasis is placed on how Duterte’s body of populist performances determines and shapes his relationship with ‘the people’ that legitimizes his populist politics, rather than the content of his perceived populist ideology, logic, discourse or strategy. In other words, ‘content and style tend to interfere and interact with one another…style sometimes generates content, and vice versa’. To this extent, Duterte is both a product of what Moffit and Tormey describe as the progressive mediatization and stylization of modern political environment, and a key molder of what they refer to as the aesthetic and performative elements of populism. These elements include: appeal to ‘the people’; crisis, breakdown or threat; and ‘bad manners’. It must be noted that these elements are not isolated from one another, but instead are interrelated with and co-constitutive of each other. Duterte’s thorough understanding and skillful implementation of these three elements help illuminate the inner logic and workings of his supposedly non-traditional and anti-establishment politics, which in turn made him a populist demigod of the contemporary times. To say that Duterte is appealing would be a gross underestimation of the kind of hallucinogenic power that his appeal has to ‘the people’ who come from various social and economic cleavages and represent diverging aspirations and interests. While a consensus over what and/or who should constitute ‘the people’ remains elusive among populism scholars and experts, nonetheless, in Duterte’s populism, ‘the people’ are comprised of both poor and rich families; illiterate and educated citizens; unskilled and skilled laborers; ‘coarse’ and ‘polished’ individuals. Duterte’s charisma has a hypnotic quality to it that induces ‘the people’ to willingly set aside their own principles and positions on various issues and replace them with the president’s preferred views and values, regardless of their contrasting backgrounds and circumstances. 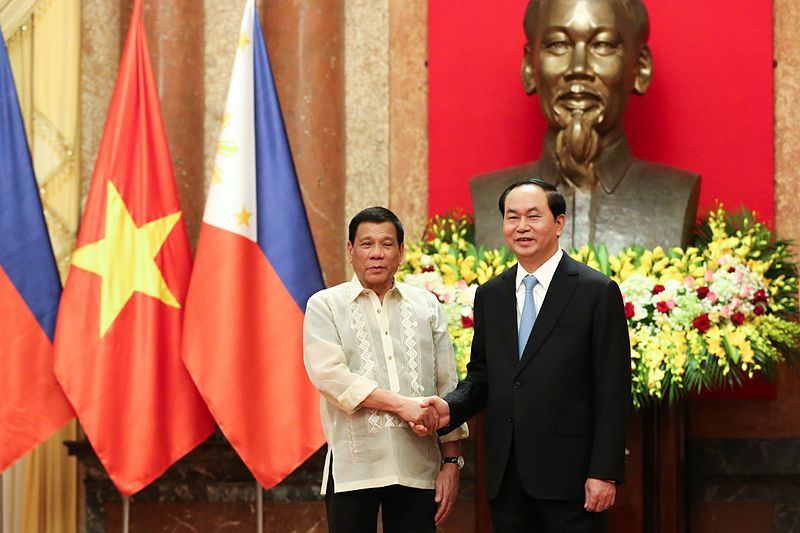 Thus, when Duterte announced that he was cutting the country’s military and economic ties with the US during his state visit to China in October 2016, many of his supporters quickly came to his defence by expressing their personal distaste and grievances toward Washington. Prior to the scathing remarks that he made regarding US hypocrisy and interventionist tendencies (specifically in the contexts of human rights and climate change issues), it would be fair to say that most of his supporters were hopeful that Washington would help protect the Philippines’ interests in the West Philippine Sea by at least providing a counter-balancing power in the region. Yet following Duterte’s series of tirades against then US President Barrack Obama in September of last year, many of his supporters have suddenly developed a more amicable rhetoric and reconciliatory approach toward China, as evidenced by the survey results conducted by the Social Weather Stations (SWS) in December 2016. This display of shatterproof loyalty should not come as a surprise. In the early part of his campaign in 2015, the then presidential aspirant managed to curse Pope Francis over a traffic incident during the latter’s visit to the Philippines. Such an outburst would have been lethal to the political career of any other Filipino politician with, considering that the majority of the voting population are Catholics. Yet thanks to Duterte’s extraordinary appeal to ‘the people’ he was not only able to survive a major scandal but the very same scandal added a new dimension to his already larger than life public persona: a demigod who was sent to redeem and save the Filipino people from the ‘false prophets’ of ruling state elites and religious establishments. That Duterte is viewed by his most zealous supporters as a demigod is neither an overstretch of the imagination nor an exaggeration to prove a point. In fact, some of his closest allies like the current Secretary of the Presidential Communications Office, Martin Andanar, even went as far as comparing the president to Jesus Christ. Andanar, whom according his own account was awed by Duterte’s ‘investment of faith in his abilities’, simply had no choice but to say yes to the president and obey, just like how the fishermen of Galilee dropped their fish nets to follow Jesus Christ and become his apostles. This is the power of Duterte’s hypnotic appeal to ‘the people’, who, despite their significant differences, are bound together by their common distrust toward the establishment ruled by traditional politicians, and their disillusionment over the value of political correctness championed by the intellectuals. Although the act of cursing the two most influential persons in the world was extraordinary in itself, however, what was even more extraordinary was the response that came from ‘the people’. Rather than condemning Duterte, his throngs of supporters took the extraordinary measure of setting aside their personal moral beliefs and convictions in order to defend, justify and rationalize the president’s behavior. In an instant, they were ready to sing praises for Xi Jinping and wage a word war against Obama – because he is now Duterte’s enemy. In an instant, they were ready to wash the dirty laundry of Catholic priests and clergies in public – because he is now Duterte’s enemy. Never mind if such realigning of personal views and values could lead to a personal existential crisis for as long as they are able to help eliminate the existential threats to Duterte’s demigod status. Luckily for his Catholic and US-friendly supporters, it did not take long for Duterte to write a letter of apology to the Pope, while the members of his team scrambled to reach out to Washington to clarify the president’s worrying comments about the future of Philippines-US relations. It would seem that the road to the American dream and the path to an afterlife in heaven are cleared of obstructions – at least for now. To further enhance his spellbinding charisma to ‘the people’, Duterte has also shown a strong bias in favour of the ‘common sense’ of ordinary citizens (as opposed to the expert knowledge of bureaucrats and technocrats) by offering simple and direct solutions to a host of problems (despite their lack of coherence). These include among others: waging of a Machiavellian war against all drug addicts and dealers within six months to enhance national security; walking away from the Paris Agreement to independently pursue industrial policies that can bring economic growth; withdrawing from the United Nations (UN) and the International Criminal Court (ICC) to avoid possible charges against his human rights abuses that can impede the war on drugs; and even riding a jestki to the South China Sea with his Philippine flag to reassert the country’s sovereignty over the contested islands. Duterte’s preference toward these ‘common sense’ solutions for resolving complex national threats and issues (whether uttered reflectively or hyperbolically) are supposed to demonstrate his unyielding and uncompromising love for the nation and its people. To compensate for the obvious substantive deficits of his preferred strategies, Duterte does what he does best: endearing ‘the people’ to himself and his cause by acting like a reluctant leader who never wanted the presidency, but nevertheless, is willing to sacrifice his own life to protect them from the enemies. Thanks to Duterte’s intoxicating appeal, such declarations are enough assurances for his supporters to cast away their doubts and ignore the dictates of their ‘common sense’ – ironically. Michael I. Magcamit is an Assistant Professor of Political Science at Musashi University in Tokyo, Japan. His current research project explains the three-way linkage between populist politics, securitization process, and realist foreign policies. He has also published numerous journal articles on Southeast Asia’s security-trade linkages, and is the author Small Powers and Trading Security (Palgrave Macmillan 2016). Aries A. Arugay is an Associate Professor of Political Science at the University of the Philippines-Diliman and a Visiting Fellow of the National Institute of Defense Studies of the Japan Ministry of Defense. Image credit: CC by Wikimedia Commons.